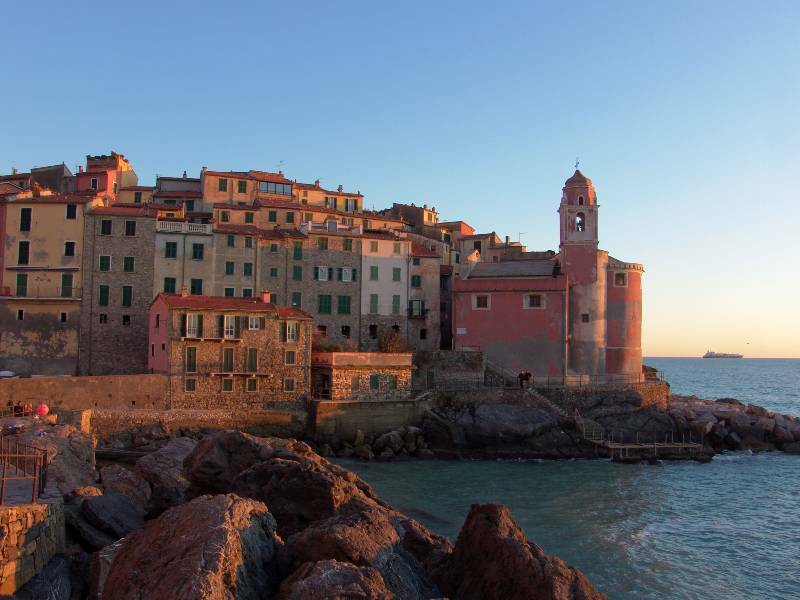 Tellaro is a picturesque seaside town located on a rocky outcrop in the eastern most part of the Golfo dei Poeti. The town is closely linked to the former village of Barbazzano, whose population suffered huge losses during the great plague of 1348, paving the way for the foundation of Tellaro, which slowly evolved between 1320 and 1380. The protective wall surrounding the houses to the north east of the town is indicative of the fact that Tellaro was originally built as a fortified town, designed to protect the province from invasions from the sea. The town once boasted three towers built by the pisans, of which only two remain. One has been turned into the bell tower of the 16th century church of San Giorgio, whilst the other marks the entrance to the town, down near the oratory of Santa Maria in Selaa. This characteristically coloured pink church is placed right on the sea, in the middle of a square surrounded by higgledy-piggledy houses painted in typical ligurian colours and lining the numerous streets and alleyways of the town. It is said that the town of Tellaro was once alerted to a Saracen invasion by a giant octopus, which approached the town and rang the church bells, awaking the citizens and allowing them to prepare for battle. However, it is also said that the real danger was presented by the pirate Gallo D�Arenzano, and that the bell was actually rung by one Marco Arzellino, who was keeping watch from the bell tower. Legend has it that he fell asleep with the rope tied around his foot, provoking the sounding of the bells and alerting the town to the imminent invasion.